“Kol Isha” is a double entendre meaning both “every woman” and “woman’s voice.” The Kol Isha Shabbat Service (KISS) in the Sidney Eisenberg Chapel at Temple Beth El on February 11 celebrated all the women of the congregation. Women led the service, chanted Torah, recited blessings, sang in the choir and offered insights into their Jewish journeys. 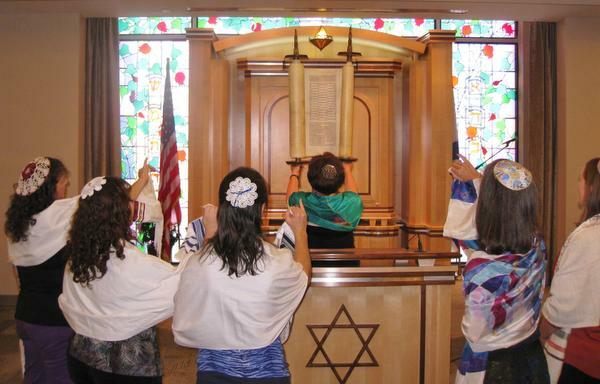 They even created a siddur for the special service, which takes place every year. After the service and the delicious Kiddush lunch, there were dance and musical performances. Shabbat Shirah/Parashat Beshalach is an appropriate moment in Jewish history to recognize women. It was there that Miriam led the women in song after crossing the Red Sea. The Haftarah is also about women — Deborah, the Judge, who leads Israel to victory over the Canaanites, and Yael, who kills Sisera, the Canaanite general. Wendy Lupul chaired the KISS task force and led the service, Bonni Pomush gave an inspiring sermon, Cantor Natalie Young led the choir and Ellen Prince choreographed the dancing. As Lupul emphasized, there were many female superstars, some of whom participated in a service for the first time. “Everyone felt connected, enjoyed the experience and learned a lot by participating in it,” she concluded.